Since 1985, Heffernan Painting has strived to become the leading residential and commercial painting contractor on the North Shore and the North side of Chicago by consistently providing exceptional quality and dependable service. The company prides itself on employing only those of exemplary character and training them as craftsmen time and again exceeding the quality and service expectations of their discerning clientele. 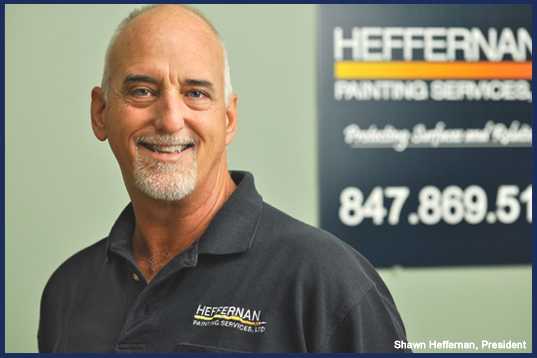 Heffernan Painting was founded in 1985, by owner Shawn Heffernan. Since that time, his sons Torin and Rob, have joined him to become one of the leading painting companies on Chicago's North Shore. Their commitment to quality, professionalism, and customer satisfaction is exceeded by none. The measure of any business is more than quality of its work, it's also the quality of its employees. It's the people who work at Heffernan Painting that bring our customers back year after year. Every painter that Heffernan sends to you home is a full time, english speaking employee...NOT A SUBCONTRACTOR (which many companies use today). Our hiring process consists of a careful in depth interview, a thorough background check, a written painting exam and a character evaluation. We provide ongoing training and support and offer a company culture that rewards excellence. And it works; for us, for our employees, and most importantly, it will work for you. Some of our employees have been with us for nearly two decades. We guarantee that you will enjoy having our staff in your home.